Click here to schedule a pick up. The process is played out across the country everyday...a cast is taken, filled with plaster and modified. Check sockets are fit and changes are made. Finally a definitive socket is fabricated. The plaster is broke out and thrown into the trash. The last check socket is either thrown away or put on a pile of other old check sockets somewhere in the lab. A few years pass and the patient needs a new prosthesis and the process starts all over again. Send us your old check socket. to the right to view sample of the information. excellent starting point for future limbs for this patient. The digitizing and storage of the file is free. We only charge for the carving. Those prices will depend on the size of the shape. Most BK shapes will be $59 or $75. Return shipping is free to you and is overnight. We will also set up and pay for shipping here if you have 2 or more to digitize. Isn’t it cheaper to work from plaster? We can’t argue the fact that a bag of plaster costs less than a foam blank. The money savings comes in your time. Instead of spending time standing over a plaster cast, your work is saved forever and you only have to modify once. Think how much time is spent modifying and smoothing casts. Your talking about BK’s. What about AK’s? Process works the same way. The carvings might cost more because the shapes are generally bigger. We can also create AK’s by measurement or save your brim styles. Patients limbs mature over time which makes it difficult to use old shapes? While patients residual limbs do mature over time, the bony prominences of a BK don’t. So, yes, we may have to make some ply changes or other small alterations to the file. But it will get you close to get the process started without having to recast. This system is already being used by our current central fab customers and works excellent. 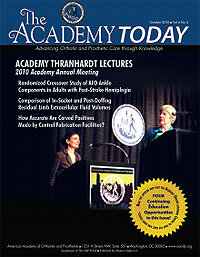 Our sister company, Rolla O&P currently has two amputee practitioners that havn’t been casted in over 10 years. When its time for a new limb we pull up the old file and get going. We also have a juvenile congenital patient that has only been casted once and we have built six limbs for him. You’re a central fab. This is just a way to get us to let you do our fabrication. While we are a prosthetic central fab with 18 years open market fabrication experience that is not our intention with this program. We have been developing and building the infrastructure for years. If you’re happy with your own fabrication then continue as your doing. We are just trying to streamline and make the process more efficient. While at the same time organizing your patient library and give you documentation for payment purposes. I don’t like or I don’t know how to fabricate over foam. We’ve been doing it for years and would be happy to give you technical help in that area. What shape capture hardware and software are you using? Our digitizer is a Provel D2 digitizer. Our carver is also a Provel. We use Tracercad for our shape manipulation software, but we are able to accept files from other systems. Most of the scanners on the market today are hand held infra red scanners that work well to take an external scan. 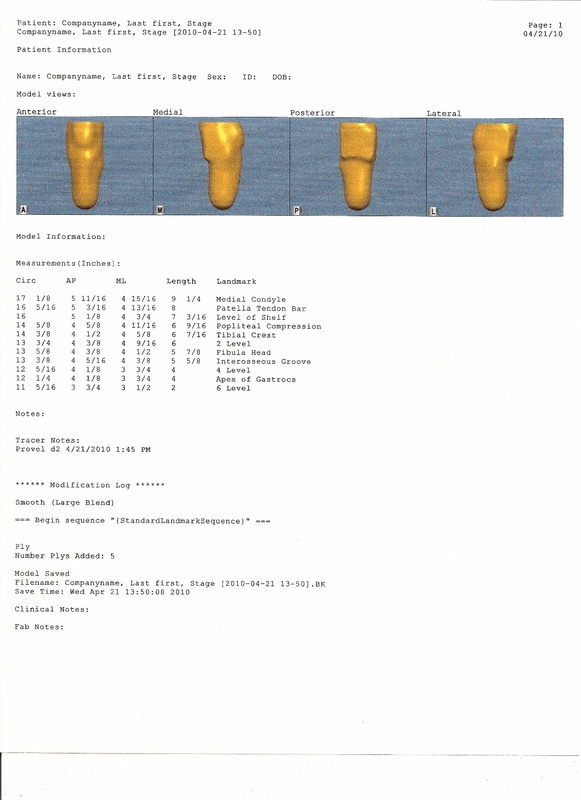 In order to save your modifications we need an internal scan which is what the digitizer does. How do I know my files will be secure? We take file security very seriously. All files are saved to two different network drives and then backed up daily to an off-site data storage company. Your files are not shared or viewed by anyone other than our staff and you and are protected. order to fabricate a new one. Importance of archiving shapes and measurments. How Accurate Are Carved Positives Made by Central Fabrication Facilities?